Der Artikel Lorenzo Palomo (geb. 1938): Dulcinea (Kantaten-Fantasie in 10 Szenen) wurde in den Warenkorb gelegt. Driven by exuberant rhythms and soaring lyricism, Lorenzo Palomo's Dulcinea is a cantata-fantasy devoted to love and freedom. The inimitable knight errant Don Quixote and his companion Sancho Panza each sing of their loves, the imaginary Dulcinea and the devoted Teresa. 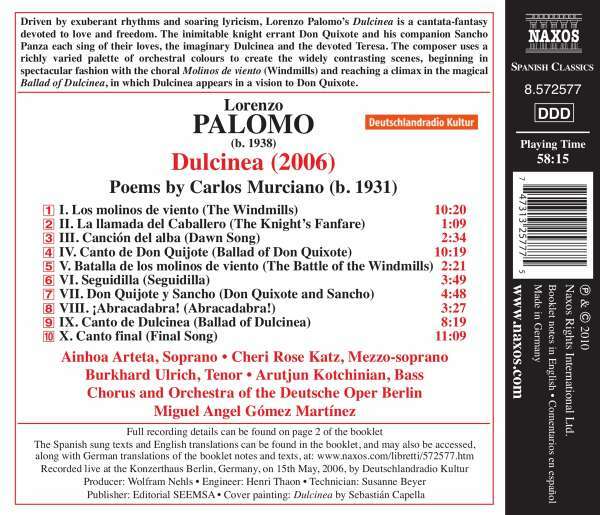 The composer uses a richly varied palette of orchestral colours to create the widely contrasting scenes, beginning in spectacular fashion with the choral Molinos de viento (Windmills) and reaching a climax in the magical Ballad of Dulcinea, in which Dulcinea appears in a vision to Don Quixote.